Effective July 1, fines for violations of certain parking restrictions will increase in the City of Staunton. The increased fines follow the completion of a survey conducted by the City’s Police Department in 2015. The City’s parking regulations are established in the Staunton City Code. Q. What cities did Staunton include in its survey and what were the results? The City surveyed various cities in Virginia, including Winchester, Harrisonburg, Charlottesville, Salem and Waynesboro. The City compared their parking fines with those presently in effect in Staunton. The results of the survey demonstrate that the City’s fines, almost across the board, are much lower than those in neighboring cities. Q: Why is the City increasing fines for parking violations? The City has been, in effect, subsidizing parking. Currently, the revenue generated from parking fees and fines does not cover the expense to operate and maintain City parking facilities. The new increase in parking fines still won’t generate enough revenue to cover the City’s operational and maintenance parking expenses. However, the additional funds will help to offset those expenditures. 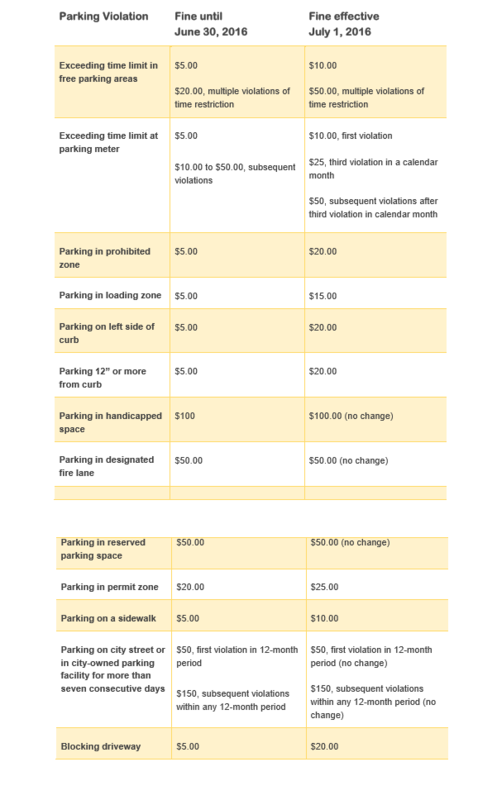 Additionally, the lower fines create an anomaly—a motorist may purposefully take chances parking in violation of restrictions, knowing that even if cited for a violation, the fine incurred may very well be less than fees charged to park in a metered parking space or in one of the City’s lots or garages. Q. How much revenue does the City receive from parking fees and fines? Last fiscal year, the City received more than $396,000 in revenue from parking fees and fines. This figure includes metered parking, daily parking fees, monthly rental fees and parking tickets. It is estimated that the increased fines will generate an additional $15,000 per year. However, it will cost approximately $598,500 to operate and maintain City parking facilities in the coming fiscal year. Q: What are the fines for the City’s most common parking violations? For more information about the enforcement of parking restrictions and fines, contact the Staunton Police Department at 540.332.3846. Please direct all other inquiries to the City Manager’s office at 540.332.3812.